Days when we are feeling particularly sluggish make putting on an onslaught of anti-aging skincare products, including sunscreens, a tad difficult. This is especially the case during the winter months when rousing ourselves from a sleep coma in our artificially hot and humid room (thanks humidifier) particularly arduous. We may also make excuses that we don’t need a sunscreen as much in the winter, because it’s not hot out. Wrong! 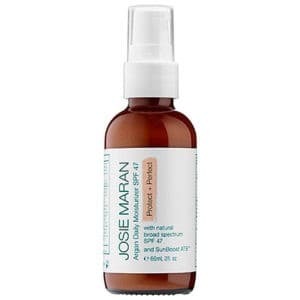 Never fear, Josie Maran to the rescue, with the highly blendable, all natural, Argan Daily Moisturizer. Not only is the formula rich enough for us to skip our moisturizer all year around as long as it is not too dry out, but it also offers a powerful level of protection from the sun’s aging rays (that unlike many think are just as strong during the winter month ). High levels of physical sun protectants – 9.4% zinc oxide and 5.9% titanium dioxide – are boosted by the antioxidant green tea, and unlike their chemical counterparts, these physical sunscreen agents lay on top of the skin’s surface rather then get absorbed. There are two versions of the product out that differ slightly. We’re fans of the honeyed color the tinted version brings to our skin, but for skin tones that lean towards the porcelain side of the spectrum, the non-tinted one may be a better fit. Although this version of the formula provides smaller amounts of zinc oxide (at 6.4%) and titanium dioxide at (5.1%), it still provides a high level of protection from the sun’s rays without a noticeable white cast. Always remember to apply your sunscreen for winter before leaving the house, even when it’s snowing as snow reflects rays! If you foresee yourself having sun exposure throughout the day remember to reapply at least every 2 hours. Check out our guide on anti-aging sunscreens as well as the effects of the sun and how it ages us if you’re interested in learning more.